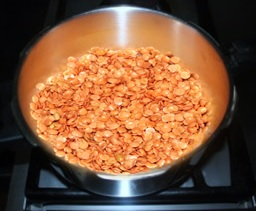 ﻿M﻿alka masoor dal or Red split lentils have a pretty reddish-orange color in its dried form, but they turn yellow when cooked. Masoor lentils are basically the split lentils without skin. Red split lentils cook relatively quickly. 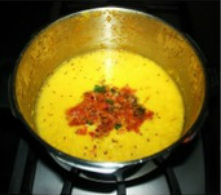 After cooking Malka ki dal seems similar to yellow Moong dal but they are very different in flavor and texture. 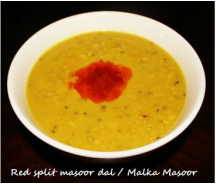 Malka masoor dal is a very simple dal, onions, tomatoes and green chilies tadka gives a wonderful flavor. water appears clear and then soak dal in 4 cups of water for 15 to 20 minutes. 4. In about 8 to 10 minutes pressure cooker will start steaming turn the heat down and cook for 1 to 2 minutes. Red masoor dal cooks very quickly. Turn the stove off and wait until steam goes down. Different brand of cooker require different time to cook. consistency, turn the stove off. 1. 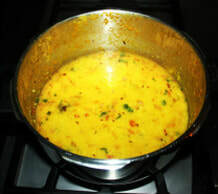 If ou wish you can skip onion tadka or any other tadka and alter Dal to your taste. 1. 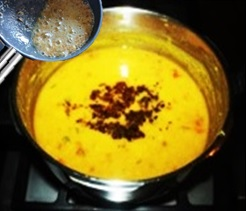 In a small pan (tadka pan) add 1 tablespoon oil, cumin seeds and asafetida and fry them for 2 to 3 minutes on medium heat or until cumin seeds become dark brown, turn the heat off. 1. Heat small frying pan, add 1 tablespoon vegetable oil, chopped onions and sauté them on medium high heat for 5 to 6 minutes or until onions become light brown, while frequently stirring them.